The weather was fantastic and conditions perfect for the first outing in the new boat. 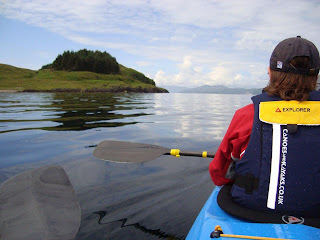 The plan was to paddle two of the trips given in the scottish sea kayaking book around the skerries at Arisaig and the second being Castle Stalker and North Lismore. We had invested in a Tahe Marine Reval Duo courtesy of excellent service from Brockbank Carlisle . 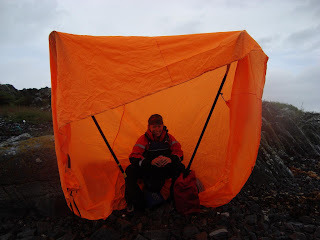 We camped at Glen Nevis which was about an 1 hour away from Arisaig. The new road link and fantastic scenary make it a very enjoyable journey! 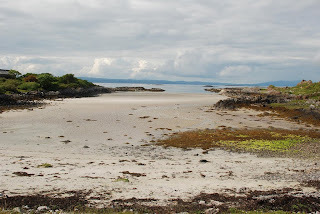 We launched just around the corner from Arisaig on a lovely white sandy beach. Very excited to try out the new machine it was not long before we were effortlessly paddling around the headland towards the skerries. 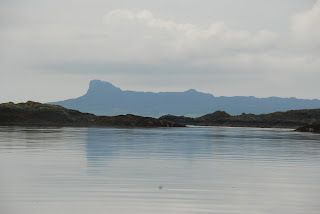 The Isle of Eigg was visable throughout the trip and looked magnificant. The tidal flow was negligable and so we had plenty of time to explore. We went past numerous nosy seals ! The boat was running so smooth through the waveless water and we were loving it! It was soon time to bid the seals goodbye and head for a lunch spot. In typical scottish fashion the weather was about to change with a squall ahead! The outer skerries was the guides recommendation for a lunch spot. We quickly nestled under the storm shelter and braved the weather happily eating and discussing the mornings adventure. 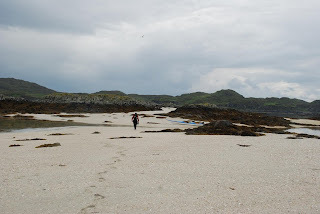 The weather soon past and we were back on our way towards Arisaig and its harbour. First there was more exploring of the skerries to do. The sea life was rich and so clear. The white sandy beaches were just beckoning for exploration. It was a photographers dream ! 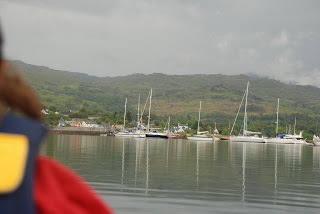 Back in the boat we headed for Arisaig harbour. The scenary was fantastic all the way in and conditions were perfect, although we both agreed that we would look forward to a bit of chop to see what the boat could really do !! 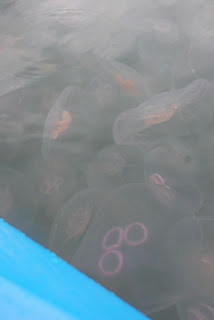 As we made our way through the moored boats we found ourselves bouncing our paddles off a field of moon jellyfish. It was incredible and quite unnerving ! Discussing how brave we were soon was put to an end once we had googled the sea creatures to find that they would not kill us like other jellyfish, still I would not like to take a swim amongst them or receive one on the face from H's paddle!! 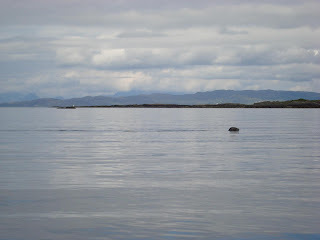 We soon left the harbour spotting more seals as we made our way back around the headland to out secret white sandy beach. We had both agreed that there are some days that you will savour forever and this was certainly one of them ! 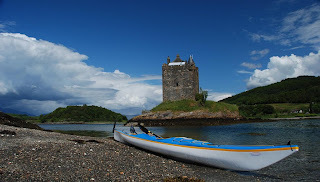 The second trip was around the Island of Shuna to North Lismore and visit Castle Stalker on the way home. The launch point was a layby on the A828, right on Loch Linnhe. The island of Shuna was clearly visable and the weather was again fantastic. 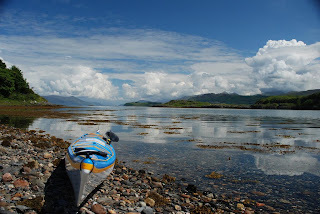 We loaded up the sea kayak with the traditional stove, soup and tea and took off on yet another scottish sea kayaking adventure! As we around the tip of the island we encountered hundreds of moon jellyfish, H was convinced they were following us! The scenary was mind blowing, the loch hemmed in by numerous imposing munros. Once Shuna had been explored and the remains of the castle on the south side visited we headed for Port Ramsay on the Northern tip of Lismore. 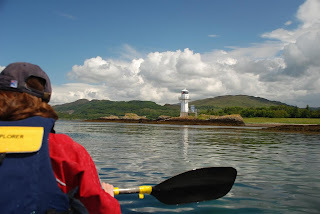 2 weeks earlier we were watching the Lismore lighthouse from the Calmac Ferry to Mull. The lunch spot was perfect, great views back down the loch and the safety of the inner harbour. It was time to put the kettle on. Having satisfied the Welsh need for a cuppa it was time to head across to Castle Stalker. The views on the way up were clear and interesting, especially the little observatory/ lighthouse that we decided to check out. Castle Stalker was the main attaction on this route. Having had a lovely tea and scone in the cafe overlooking the castle earlier in the year we were determined to look the non tourist way next time! And so to the castle and yet again a perfect place for a cuppa !! Having circumnavigated it several times to get numerous photos we headed back to the layby. 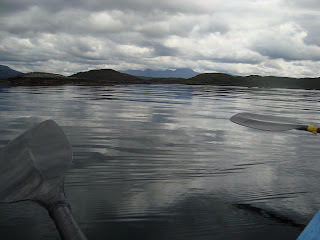 On reflection the sea kayaking and the weather was perfect all weekend. 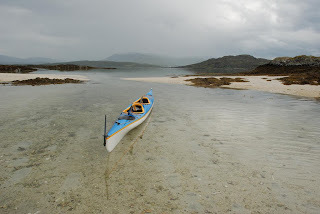 We always believe that an outdoor adventure in Scotland never disappoints !